The recent wave of mergers among pharmacy benefit managers may give those firms more power and clout, but it's unclear whether employers who work with those PBMs will be in store for better deals or major headaches. Much of the merger mania of the health care industry is driven by PBMs — those behind-the-scenes firms that handle prescription drug benefits for self-insured employers. They deal with drug claims information and processing and secure discounts and rebates by negotiating with retail pharmacies and pharmaceutical companies. Tyrone's comment: PBMs also handle prescription drug benefits for fully-insured employers. Usually, the larger the PBM, the more influence it wields in negotiating better prices and rebates and, in theory, passing those savings on to employer clients and plan members, experts say. 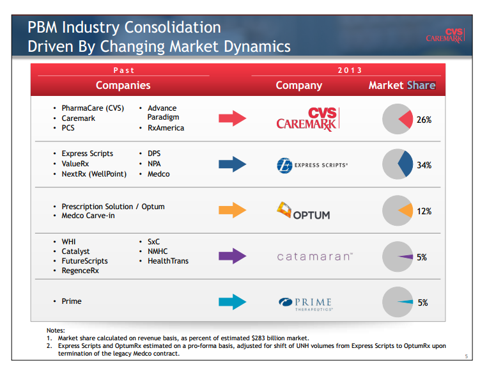 If the recent wave of consolidation is any indication, PBMs have taken the “bigger is better” mantra to heart. In July, United Healthcare Inc.'s Optum Inc. closed its deal with Catamaran Corp., making Optum the third-largest PBM based on prescription volume. In August, CVS Health Corp., parent of second-largest PBM CVS/Caremark, bought Omnicare Inc. and in June, agreed to acquire Target Corp.'s nearly 1,700 pharmacies and 80 medical clinics. More recently, Walgreens Boots Alliance Inc. announced plans in October to acquire Rite Aid Corp., effectively scooping up Rite Aid's Envision Pharmaceutical Services, a small PBM doing business as EnvisionRx, in the process. 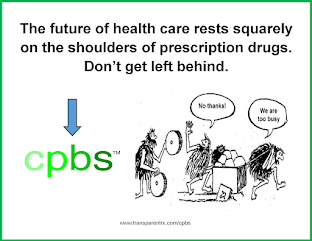 Consolidation among PBMs has been going on for years. Express Scripts Holding Co. secured its throne as the largest PBM after its 2012 acquisition of Medco Health Solutions Inc., and CVS bought Caremark L.L.C. in 2007. The implications for employer clients who work with a PBM that merges with or is acquired by another organization depends heavily on the type of deal, said Allan Zimmerman, national pharmacy practice leader at PricewaterhouseCoopers L.L.P. in Kansas City, Missouri. A PBM that buys another PBM primarily gets scale and the potential for better deals with drugmakers, but improved service quality also is a possibility, Mr. Zimmerman said. For instance, the PBM being acquired may have a better technology platform that the parent PBM can utilize. What's most interesting to watch, however, is “when you see a PBM acquiring a vertical in their supply chain” or becoming a vertical component in another organization's supply chain, he said. Examples include drugstore chain Walgreens buying Omnicare, which provides services to long-term care facilities, or Rite Aid buying EnvisionRx. In such deals, cost savings for employers likely would be “incremental,” and employers should talk with their PBM about the possibility of a better deal, Mr. Zimmerman said. For drugstore-owned PBMs, there's also a chance that the retail stores could be an outlet for PBM services, enhancing convenience for plan members, said Craig Oberg, St. Paul, Minnesota-based managing consultant with pharmacy benefit consultant The Burchfield Group Inc. If Walgreens chooses to invest in its newly acquired PBM, it could follow in CVS' footsteps by allowing PBM members to pick up their 90-day supply of medication at their local store but still retain the mail-order discount. With larger PBMs, there's also the opportunity to push back against the pricing set by specialty drugmakers, said Josh Golden, practice leader of employer consulting at Pharmaceutical Strategies Group L.L.C. in Atlanta. A major driver of health care costs, specialty drug spending increased 30.9% in 2014, according to Express Scripts. “Size really does matter in this part of the pharmacy supply chain, and that's because the pricing arrangements and the deals that are struck right now are really driven by targeted negotiation (by the PBM) with specific pharmaceutical companies ... in particular in the specialty drugs space,” Mr. Golden said. Much of the value is derived from rebates PBMs are able to secure, he said. Last year, for instance, Express Scripts led the charge to push back against the atmospheric pricing of hepatitis C drugs by choosing to cover only one hepatitis C treatment in exchange for a big discount. That pit drugmakers against each other and ultimately lowered costs for other payers. Tyrone's comment: It's always been the case PBMs negotiate better pricing from manufacturers. This is not the issue. 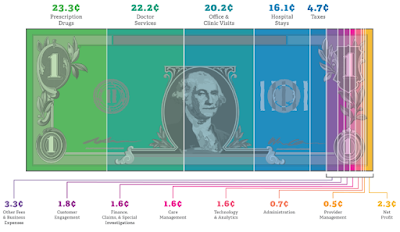 The issue is the payers' share of these savings which is only 10 cents on the dollar in many cases. The PBM "hides" the remaining 90% to increase their profit margin. The same type of “formulary strategies” are occurring now with costly cholesterol drugs, called PCSK9 inhibitors, Mr. Golden said. Of course, there are downsides to PBM consolidation. The more mergers and acquisitions that occur, the fewer PBM options employers have, Mr. Golden said. Different PBMs have varying business models, whether traditional or transparent, so finding one to fit an employer's philosophy might be more difficult. Tyrone's comment: Despite what you've been told, traditional, transparent and pass-through business models are all the same. They are nothing more than a play on words. The only PBM business model which provides a client-comes-first standard of care is a fiduciary one. Experts say there often are service disruption and client experience issues while two firms integrate. When Express Scripts bought Medco, the disruptions “generated a lot of noise, and frankly it impacted Express Scripts' retention rates for a period of time,” Mr. Golden said, adding that the industry is anxious to see if Optum and Catamaran can merge without some of those same issues. Perhaps the M&A activity won't significantly affect employers, said Randy Vogenberg, Greenville, South Carolina-based principal at the Institute for Integrated Healthcare and partner at Access Market Intelligence. “When all is said and done, my sense is that it's not going to make that much of a difference because we're talking about drug pricing that's controlled by the manufacturer and that hasn't changed regardless of all the mergers and acquisitions,” Mr. Vogenberg said.